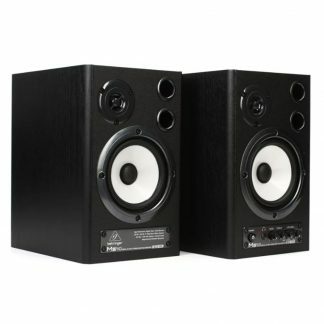 If you’ve read the Sweetwater Studio Monitors Buying Guide, then you already know about the problems that go with putting your monitors too close to walls. That’s when extreme low frequencies actually cause your walls to vibrate and act like big speaker cones, filling the air with false harmonics and ruining your ability to mix with accuracy. But sometimes the shape and size of your room leave you with no alternative but to place your monitors close to a wall. That’s where the Eris E5’s acoustic tuning controls come in handy. By cutting your Eris E5’s bass by up to 4dB, you can compensate for this phenomenon, without neutering your sound. Offering up a solid 70 watts of Class AB amplification gives the PreSonus Eris E5 a major advantage over studio monitors that feature just enough power to get the job done. It may sound kind of technical, but the way this feature benefits you is actually pretty straightforward. With the Eris E5’s gain set to unity (the U in the middle of the dial), you can comfortably monitor your mix at an appropriate level, but still have plenty of extra volume to spare so that run-away transients (momentary loud peaks) sound louder, instead of just distorting at the same relative volume. It’s hard to express just how readily this easily overlooked feature of the Eris E5 can save your mix. 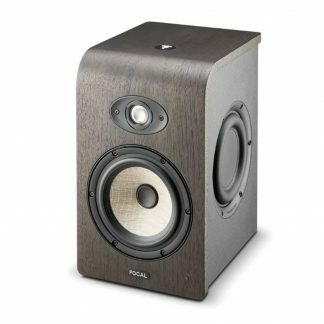 Say you want to upgrade your monitoring system with a nice new subwoofer – your Eris E5 monitors easily fit the bill. That’s because each Eris E5 includes a 3-position highpass filter onboard, which lets you cut frequencies below either 80Hz or 100Hz. 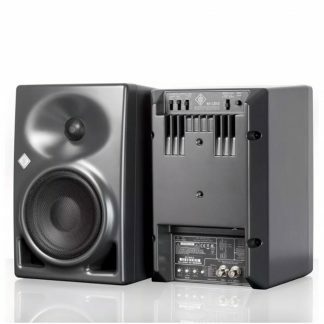 If you need to further fine-tune your sound to achieve a flat frequency response, you’ll find fully variable high-frequency and midrange controls on the back that let you boost or cut up to 6dB in their respective ranges. 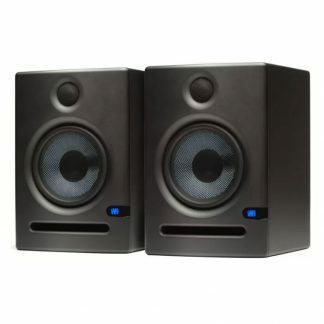 What’s more, PreSonus outfitted their Eris E5 studio monitors with unbalanced RCA as well as balanced TRS and XLR inputs, so you can connect them directly to just about any sound source in your studio.